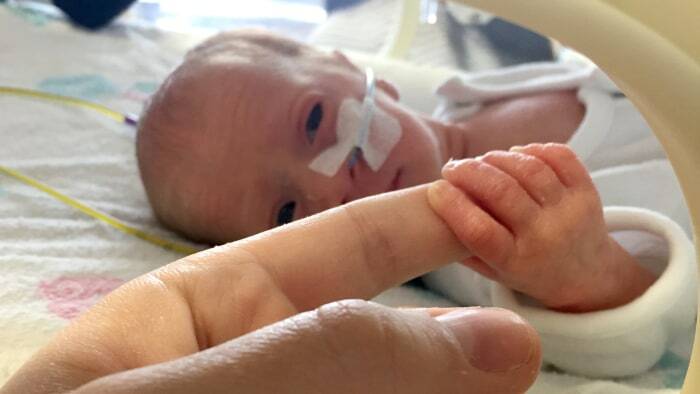 Millie Smith and Lewis Cann’s baby daughter, Skye, only lived for three hours, but even that was a miracle — and her legacy might help other families who lose a baby. Smith first found out she was pregnant in November 2015, and she told TODAY Parents she had a “gut feeling” she was having twins. Twins have run in her family for many generations, so Smith was not surprised when she found out at 10 weeks that she was expecting identical twin girls. Just two weeks later, Smith and Cann were devastated to learn that one of their babies had a condition incompatible with life. “During the scan, the doctor didn’t say anything. I was very excited and loved seeing the little babies, but she was silent. Both Lewis and I immediately knew there must be a problem,” said Smith. Their doctor broke the news that one of the babies had anencephaly, a neural tube defect in which the upper part of the neural tube does not close all the way, preventing parts of the brain from forming correctly. 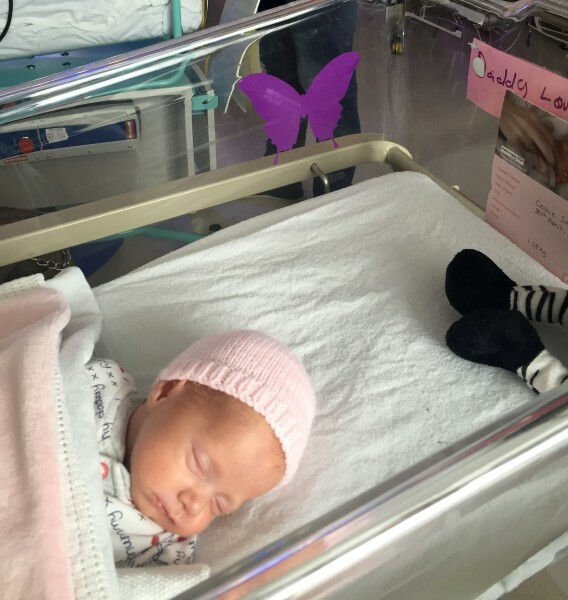 Smith and Cann chose to move forward with what was at that point an extremely high-risk pregnancy, knowing that they would have to say goodbye to one baby very shortly after her birth and that there were risks involved for their other baby, no matter what they did. When Smith went into labor at just 30 weeks on April 30, she ended up needing an emergency C-section. At Kingston Hospital in the United Kingdom, where the twins were born, Smith and Cann were able to have a both a “bereavement midwife” during the birth and to stay in a special room the hospital calls the “Daisy Room,” where families can spend time with a baby before she passes away and shortly afterward. It was that moment that Smith decided she needed to create something so that moment didn’t happen again. She decided to design a poster for the NICU explaining and reminding both hospital personnel and visitors that any incubator with a purple butterfly on it meant that the baby was one of a set of multiples in which one or more babies were lost. “I chose butterflies, as I felt it was fitting to remember the babies that flew away, the color purple because it is suitable for both boys or girls,” said Smith. Now, the idea has spread well past Kingston Hospital, with interest from other hospitals in several countries around the globe. Thank you for every one of your hard work on this web site. Kim take interest in conducting internet research and it’s easy to understand why. All of us hear all relating to the dynamic tactic you offer worthwhile suggestions by means of the web site and in addition boost participation from some others on the article so our own princess has been starting to learn so much. Take pleasure in the remaining portion of the new year. You’re the one conducting a fantastic job. I must show appreciation to the writer for rescuing me from this difficulty. Just after browsing throughout the internet and meeting things which are not beneficial, I was thinking my entire life was over. Existing devoid of the answers to the difficulties you’ve fixed by means of your entire article content is a serious case, as well as ones which may have adversely affected my career if I hadn’t encountered your site. That understanding and kindness in taking care of all areas was invaluable. I don’t know what I would have done if I hadn’t come across such a solution like this. I can at this moment look forward to my future. Thanks a lot very much for your professional and sensible guide. I will not hesitate to recommend your web page to any individual who should have recommendations about this issue. I intended to draft you a little bit of remark so as to give thanks the moment again relating to the remarkable strategies you’ve documented on this website. It was pretty open-handed of people like you to deliver publicly just what a number of us could have distributed for an electronic book to generate some dough on their own, principally considering that you could possibly have done it if you considered necessary. The secrets as well worked like the good way to be sure that someone else have the same dream like my very own to learn way more regarding this problem. I am certain there are a lot more fun sessions ahead for individuals who scan through your blog. I happen to be commenting to make you understand of the exceptional experience my wife’s child went through studying yuor web blog. She realized some things, most notably what it’s like to possess a great helping nature to have many more completely learn chosen very confusing subject areas. You actually surpassed our expectations. Thank you for distributing these powerful, healthy, educational and even cool thoughts on that topic to Tanya. I precisely desired to appreciate you again. I’m not certain what I could possibly have achieved in the absence of the actual points contributed by you directly on this concern. It absolutely was the depressing circumstance in my position, nevertheless observing your specialized fashion you resolved the issue forced me to cry over fulfillment. Now i’m thankful for this information and even believe you know what a great job your are carrying out teaching others with the aid of your website. I know that you haven’t encountered all of us. I precisely had to thank you very much all over again. I do not know the things I could possibly have carried out without those concepts shown by you about this concern. It had been the frightful matter in my view, however , seeing the very specialised technique you managed that forced me to weep with delight. I’m grateful for your help and then sincerely hope you comprehend what an amazing job that you are undertaking educating the mediocre ones via your site. I’m certain you haven’t encountered all of us. I intended to put you the very little observation to be able to thank you yet again for all the beautiful knowledge you have contributed above. It’s so strangely open-handed of you to supply easily just what many individuals could have offered for sale for an e book in order to make some profit for their own end, precisely since you could have tried it in case you desired. The things as well served like a good way to be aware that the rest have the identical eagerness similar to my very own to see lots more around this problem. I am certain there are many more pleasant instances in the future for people who look over your website.